The Destiny 2 beta is live on PlayStation right now, and the game’s massive community is doing its damndest to do what all testers should and break the thing. One YouTuber has done a better job than Activision might like, and managed to glitch into an area not yet intended for our eyes. Where will you be hunting for Lost Sectors? Check out our guide to Destiny 2’s planets. 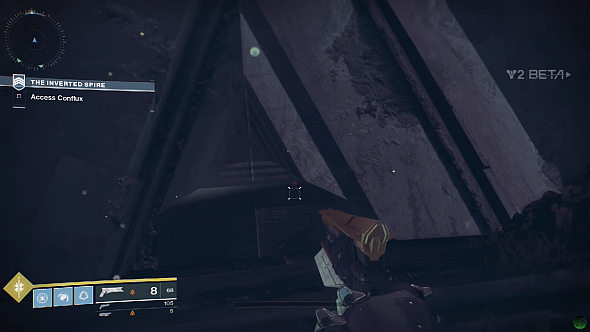 StrandedKenni made his way to the out-of-bounds area from the Inverted Spire strike on Nessus, and you can check out his video above. It’s 12 minutes of walking and jumping through misaligned and blinking geometry until the world starts to make sense again at around 12:30, when Kenni emerges into a cylindrical chamber. He then has a look around, and finds a vault door with a triangular motif that the Vex use a lot (for example, see the Glass and Time emblem or the door to the Gatekeeper in the Vault of Glass). Later we see a circular plate on the floor, reminiscent of a manhole cover. As you’d expect, there are no enemies and no obvious objectives, but it’s clear from the coherent level architecture that this space is designed for something – Kenni’s theory is that this is one of Nessus’s Lost Sectors. Lost Sectors are new for Destiny 2, and should make its exploration mode much more interesting than it was in the original. They are dungeons hidden away in the game’s open world (though probably not as well-hidden as this), which contain enemies and a boss that guards high-tier treasure.